Being a sales leader is something we all desire to be. I don’t think anyone who is committed to being in sales wants to be seen as a sales follower. Can you imagine walking up to a customer and saying, “Hi, I’m your new sales follower.” I can only imagine how the customer would respond. Your job, regardless of your title, is to be seen as sale leader. A few years ago, I was working with a sales team in Trinidad. As we dug into a particular issue, it set me on a mission to simplify and narrow things down. After that meeting, I created the 9 traits of a sales leader. 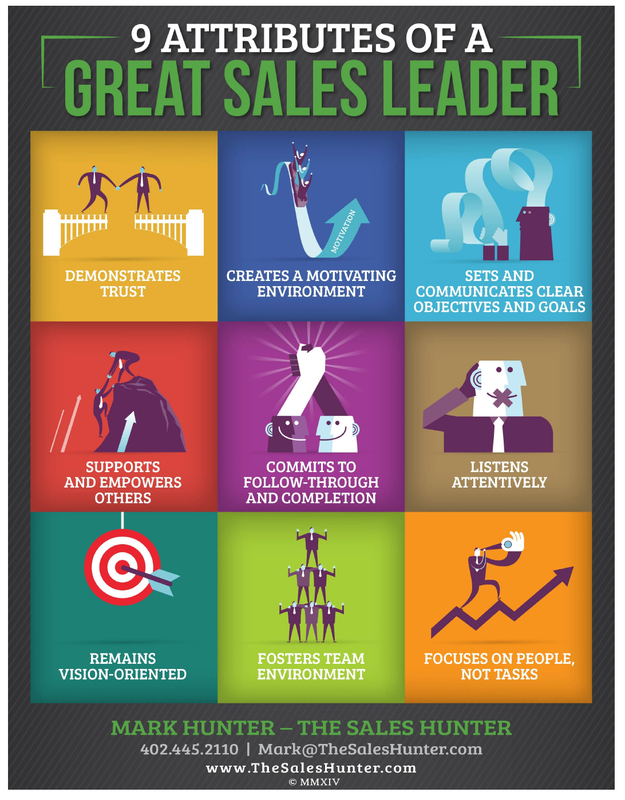 To make it easy for you, I’ve created the 9 Attributes of a Great Sales Leader info-graphic. I am happy to share. Sales at all levels is about leadership. This coming year, I’m committing myself to be more focused than ever on these. Leadership is a journey; it’s never a destination for one simple reason— it’s about people. People are anything but consistent. In the months to come, I’m going to challenge you to take one of the 9 traits and focus in on it. Work to define what it means to you and to those you lead. The world is crying out for leaders who value others. As you take time to reflect on these traits, you will notice a common point in all nine —people. Leadership is about being 100% focused on others. How focused are you on others?